The first edition release of the NUI Group community book Multi-Touch Technologies, is here! This book comprises state of the art articles from the NUI Group Community Wiki, as well as several chapters written by leading experts in the field specifically for this publication. Detailing basic hardware technologies as well as the process of developing software suited for multi-touch systems, this book provides a technical introduction to the world of multi-touch. I am proud to have been a contributor to and co-author of this book. Please check it out as it is full of helpful information. Well done to all who took part and made this possible..
Click here to download a copy of the book..
For more info please see the original post here at NUIGroup. We have gone ahead with the printing process, through Lulu.com’s online printing services. A this point, we are still waiting for an ISBN number to allow distribution through Amazon.com and other retail channels to achieve maximum readership. Once the ISBN application process is completed, ordering information will be made available. 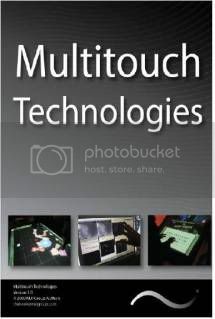 Tentatively, the price for a copy of Multi-Touch Technologies is $7.00 USD, + shipping. We are working to lower this cost: it is not final. You are currently viewing the archives for June, 2009 at Interactive IO & More.